Arrington Performance HEMI Engines are known for their power and reliability. You can start with one of our standard blocks (forged 392, forged 345, 426 stroker) or get one built just for your application. The Arrington engine builders pour all of their NASCAR engine building knowledge into each HEMI engine they produce. Short block, long block, or full crate engines let you choose from a variety of setups. Just getting started? These categories are the "getting started" list for modifying your modern HEMI engine. Some are appearance oriented and some are for performance. There is something for every HEMI owner here. Browse our collection of "getting started" add-ons and gift items for any HEMI enthusiast. Power adders force more power from your HEMI power plant. These HEMI power adders are designed and engineered for your specific application. Look no further if you want to add Towing Power to your Ram 1500, you commute in your Dodge Charger everyday, or race your Dodge Challenger on the weekends. Bolt on increased horsepower and torque without invasive modifications to your HEMI engine with simple upgrades that increase the horsepower of your engine in as little as fifteen minutes and provide reliable power. Try out an API signature throttle body and cold air intake combination or upgrade the exhaust system to unleash the HEMI's classic muscle car sound. Add performance parts to your mild to wild engine build to get the horsepower you want. Arrington selects and sells only the parts that offer you reliable performance for your HEMI engine. These parts will allow you to complete your build or eke out the extra torque you need to win. Getting power to the ground and smoothing out the ride of your performance LX or LC all comes down to the suspension and tires. Lower the profile of your Challenger with a set of coil overs and wheels and tires or Improve the steering and driving characteristics of your ride with a strut brace and new set of bushings. Replace a worn out clutch, upgrade to a race inspired higher stall torque converter to transfer the power from your new HEMI to your drivetrain more efficiently. Upgrade your NAG1 Transmission to withstand the power of your HEMI stroker engine. When increasing the power of your HEMI don't forget to upgrade your axles and rear end to withstand the higher torque and horsepower output. With an upgraded driveshaft or axle assembly you can safely transfer the horsepower from your transmission to the tires. Look no further to upgrade the class of your HEMI powered ride. Dress up your HEMI engine bay with billet cap covers or add chrome accents to your interior. Want to decrease weight with a carbon fiber deck lid and hood? Look no further. Get show quality finishes and the custom fit you want the first time with API's selection of HEMI Appearance products. Looking for a Jeep Wrangler HEMI conversion or want to add a Gen III HEMI to your classic muscle car? Arrington Performance has you covered. From a Carburetor conversion for your HEMI to a complete ready to rock HEMI crate engine you can get your parts here. Going lean? When you increase the air volume or add a power adder to your HEMI you need to add more fuel too! Check out these fuel systems and Oiling system components to keep your Air/Fuel ratio right and your HEMI engine clean and well lubricated. Anyone headed to the track knows that staying safe is not only a want but also required by some class regulations. Get the stopping power you want with an upgraded set of brakes or get the safety you need to run in a high speed class like a roll cage, engine diaper, or driveshaft safety loop. HEMI engine tuning and handhelds are used to address not only drivability issues but to properly calibrate your ECU and TCM to run correctly with installed performance parts. Already have a calibration? Install a boost or air/fuel gauge to monitor your HEMI engine's stats in real time. DId you know about our Hellcat 426 short block? These Bezels and Inserts are an affordable way to improve your car's overall look. Challenger Door Plates: A pair of door sill guards, like these help protect the interior door sills from scratches and improve the looks of your new Challenger. Comes in brushed stainless steel and proudly features the "Challenger" vehicle logo. 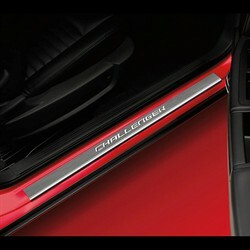 This is a genuine Dodge Challenger performance accessory. DODGE, Hemi, CHALLENGER, CHRYSLER 300, MAGNUM, CHARGER, LX, LC, RAM, JEEP®, WRANGLER™, GRAND CHEROKEE™, WJ™ and other names used in on this website are registered trademarks or trademarks of Chrysler, LLC or their respective owners.